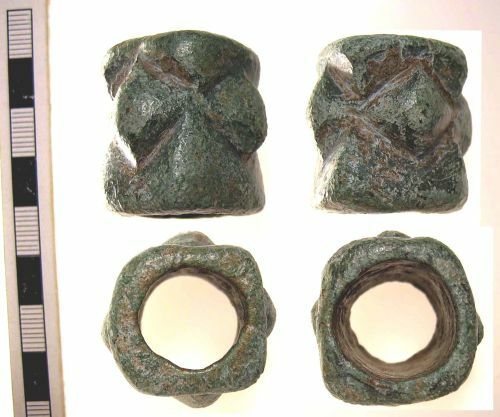 Looking through the Portable Antiquities Scheme website in the UK, I have seen a couple of knobbed medieval mace heads that have been identified as being ornamental. Adam Daubney has suggested that these maces “are ecclesiastical staff fittings rather than offensive weapons.” I am not sure precisely why this designation is made, although the PAS website suggests that it might be due to the squat shape of the mace heads, and the fact that similar maces heads are found in Ireland and Scandinavia, whose elaborate decoration suggests a non-military usage. However, the PAS record for one of the mace heads does acknowledge that the suggestion of being ecclesiastical heads has not been confirmed. What do you think of this hypothesis? Are there other forms of evidence for ecclesiastical, decorative mace heads in England? Or do you see this as an academic misinterpretation based upon pre-conceived notions of how a mace should look? I have attached images of two such mace heads, and there may be other mace heads that I have not seen thus far. You can read more about these two here: https://finds.org.uk/database/artefacts/record/id/398122 and here: https://finds.org.uk/database/artefacts/record/id/163436. Possibly, Mart, although why assume there was a specific ceremonial or ritual use for maces among the clergy? It's one thing to believe they used maces in war, and quite another to suggest the maces have a liturgical function or some other such role. do you see this as an academic misinterpretation based upon pre-conceived notions of how a mace should look? Craig, highly decorated weapons (and armor also) of many different cultures have been declared as being "ceremonial" etc by many people but the facts do not always support such claims. Warriors / soldiers of high status were expected to and often carried weapons and wore armor that showed their wealth and status, this was ;part of the job so to speak and there is not reason to assume that these types of weapons / armor would not have been used in battle if needed. If these highly decorated items were made in the same manner as the items used my lower ranking warriors / soldiers then they are basically no different , so the question is are they battle worthy. These look totally utilitarian bronze mace heads to me. It would be very easy to make these much nicer than they are if they were to be ceremonial, so unless the ceremony was based around boring looking hitting sticks, I would say these are weapons.